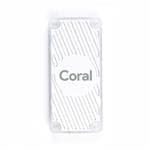 The Coral USB Accelerator is a USB device that adds an Edge TPU coprocessor to your system. It includes a USB socket so you can connect it to any Linux-based system to perform accelerated ML inferencing. The onboard Edge TPU is a small ASIC designed by Google that provides high performance ML inferencing with a low power cost. For example, it can execute state-of-the-art mobile vision models such as MobileNet v2 at 100+ fps, in a power efficient manner.